Looking for a universal tablet stand to hold your device? 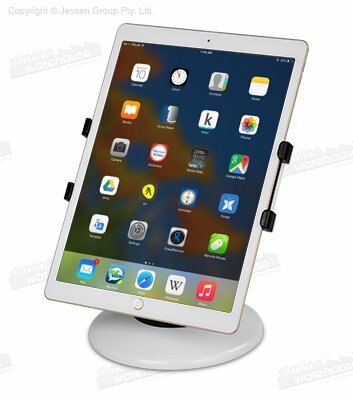 This countertop iPad holder is perfect to hold a wide variety of devices that are 7.9" through 13", which includes most iPad, Android and Windows tablet models. The adjustable bracket uses a rubber backing to prevent the tablet from sliding, and the extending arms help tightly hold the screen in place. 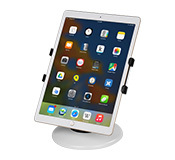 This table holder for iPad, universal tablet stand makes it easy to change between landscape and portrait orientation without removing the device from the holder. You can easily tilt the screen as well to provide the best viewing angle and even switch viewpoint between a customer and employee at a shopping centre, retail store, restaurant, bar, or cafe! The stand itself also rotates 360° making it easy to spin the holder to face a person instead of changing the angle. This holder for tablets is made from durable plastic for long-lasting use in any location, with the white finish ensuring it fits in with any décor and brings a professional look to all environments. 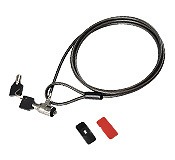 A bracket buckle at the back of the stand makes it easy to remove the device whilst in the holder if an employee needs to carry the device with them when helping a customer. Order by 2pm EST from Slimline Warehouse to receive same day despatch to anywhere in Australia with this and most other in stock items!